Yesterday, I went to a local Montessori school to do booktalks for women's history month and I also did a storytime for the lower elementary students. As is too often the case, I was grabbing books on the fly a few hours before I was supposed to go. This can end in disaster. Or, it can result in a handful of new storytime favorites. Luckily, the latter proved true (on this occasion, anyway), and I'd like to share with you my newest storytime favorites for the younger elementary school crowd. These books certainly made quite a splash in my storytime and I hope they will do the same for you! Trout, Trout, Trout! (A Fish Chant) by April Pulley Sayre. 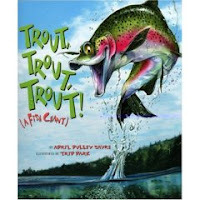 A fun, fun readaloud that consists almost solely of the names of fish. The illustrations are hilarious and the fish names are arranged in a chanting rhythm, each stanza ending with a line like "Trout Trout Trout!" or "Cod Cod Cod!" More often than not, the kids said that last repeated line along with me. They really enjoyed it and seemed interested when I explained that all the fish named in the book were real fish and that information about those fish were included in the back of the book. If we'd had more time, I might have gone back and read it again, stopping to read the information about some of the fish as we went along. Sayre has others along the same vein: Ant Ant Ant (An Insect Chant) and Bird Bird Bird (A Chirping Chant). 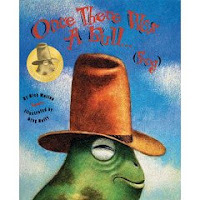 Once There Was a Bull... (Frog) by Rick Walton. I started this story by first explaining that we were going to read a story that had a lot to do with compound words, like "bullfrog". Words that could be split into two different words. I asked if they could come up with any compound words (and they came up with some great ones). Then I started the story. The story is about a bullfrog who loses his hop and then goes to look for it. The gimmick is that the compound words are all broken up on a page turn. So the first page of the book says "Once there was a bull..." with a picture of a bull. When you turn the page, you see that the word continues with "...frog" and you see the picture of the frog. The kids had fun guessing which compound word was being used. Some they knew (like straw...berries or grass...hoppers) and some they didn't (like stage...coach). Although the story itself is not all that exciting, the way it's presented makes it a lot of fun. 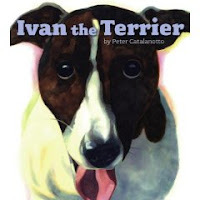 Ivan the Terrier by Peter Catalanotto. This was hands-down the hit of my storytime. In this book, each attempt to share a fairy tale story is rudely interrupted by Ivan, a spirited canine determined to be the center of attention. 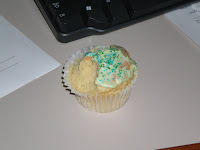 We start out with the Three Billy Goats Gruff, then try Goldilocks and the Three Bears, etc. After one page (in which kids can spot tiny, far-away Ivan running to jump into the story), Ivan appears and his barking and jumping frighten all the storybook characters away. The kids and teachers were all laughing out loud and picking out every detail in the illustrations. Although the inclusion of fairy tale characters might indicate a younger audience, I think it worked perfectly with these K-3rd graders because they already knew the fairy tales and could recognize the stories from one spread. Looks like some fun books. I like Catalanotto's other books, too.